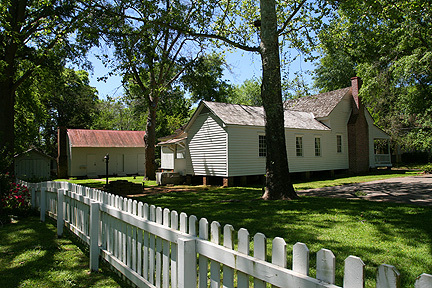 The elder city’s quiet appeal is ever present, inviting visitors to reminisce about the days of Texas independence when Nacogdoches played an important part in the state’s history. One can almost hear the clop-clop of horse hooves and clatter of wagons on the brick streets of the old town square. 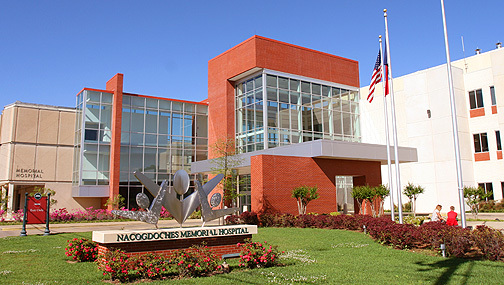 The Nacogdoches Visitor Center is where travelers should go first. It’s located in the old Post Office building which for many years served as Nacogdoches’ library before it became an exceptional introduction to the city. The Center sits in the middle of the Square surrounded red brick avenues and historical buildings, each with a story to tell. Get the young person behind the counter talking and you’ll hear plenty about the Oldest Town often from one of its newest residents. Grab a handful of brochures and pick up a map so you’ll know where to go on the walking tour. 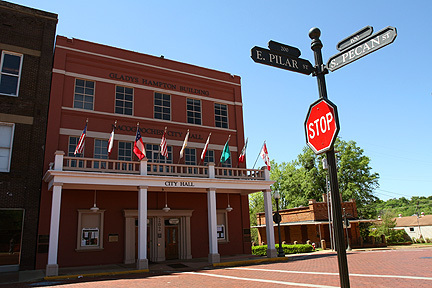 Hundreds of years of Texas history is within a few blocks of the square. 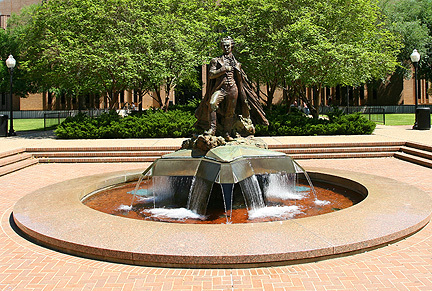 Many points of interest on the walking tour date back to the days of Texas Independence and before. Nacogdoches was a Native American settlement before the Spaniards showed up. The city was an important stop along the El Camino Real, or King’s Highway, which stretched from deep in Mexico north and East all the way to the Mississippi and beyond. The roots of Texas independence grew first in Nacogdoches. Nacogdoches had been around for centuries when Lufkin sprouted as a timber town down south. Nacogdoches, like the strong stock of individuals who put down those brick streets and helped build Texas, is strong and proud and never in a hurry. It’s the kind of place city folks can appreciate when they’re looking for breathing space. Take your time on the walking tour. Enjoy the scenery. Then climb into the car. Just up the road in most any direction is more Old-town adventure. Up Mound Street from the square there’s the Old University building. Nacogdoches University was chartered by the government of the Republic of Texas in 1845. The University building served as a hospital during the Civil War. The Masons used the building to house a school for a while and the Catholic Church put it to use as a school for a time as well. Stephen F. Austin State University used the building while the main campus was under construction in the 1920’s. These days it stands as a majestic reminder of Nacogdoches’ history. Within the walls which once heard the rustle of school books, the creak of soldier’s boots and the chatter of students, visitors will find today an excellent collection of period furnishings and memorabilia. On up to the north a bit on the campus of SFA there’s more history in the Stone Fort Museum. The Stone Fort served in many different capacities at its original location closer to downtown. It was torn down in 1902 and then replicated using the original stones on the college campus in 1936. 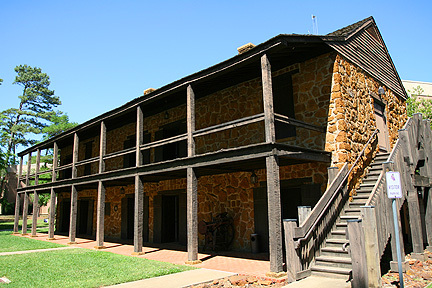 As the home of Nacogdoches native Don Antonio Gil Y'Barbo, the founder of present day Nacogdoches, it played a major roll in the tug-of-war for Texas independence. Like the Old University building, it’s chock full of history and open to the public free of charge. 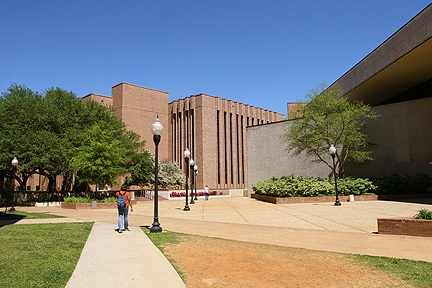 The campus of Stephen F. Austin State University, a major state college, fills several square miles of land right in the heart of Nacogdoches. College kids roam the campus while classes are going on and then vanish during breaks. It’s really rather amazing how little one notices the more than ten thousand young students who call SFA home during the fall and spring. They blend in quite well with the ambiance of Old Nacogdoches. Old and new come together on the Stephen F. Campus. The university’s administration is housed in the original buildings dating back to the 1920’s. Massive columns sitting above rows and rows of concrete steps demand that visitors stop and reminisce over the generations of students who have started their careers at SFA. Across the street from the old buildings stands a new and modern Student Center, completed in spring of 2007, catering to the needs of students who live in the many dormitories and apartment complexes which dot the campus. The college offers students the opportunity to study a wide range of subjects. Business, forestry, and education are only the most prominent degree programs at SFA. The college was founded as a teacher college and remains dedicated to its original mission. The School of Forestry and School of Business are also recognized as exemplary. Few places in Texas are more picturesque than the campus of SFA. Students are as proud of their beautiful campus as citizens of Nacogdoches are proud of their history. Visitors should take a while to walk the campus. Don’t miss the statue of the school’s namesake in front of the library, just north-east of the Stone Fort. Some of the other don’t-miss attractions in the Oldest Town in Texas are the Azalea Trail and Millard’s Crossing. “Strolling through the Ruby M. Mize Azalea Garden is like walking through a kaleidoscope." The Azalea garden, carefully tended on a plot of land belonging to SFA and east of the campus along University Drive, reveals the beauty of East Texas. People might not remember how rich East Texas is in history. They can’t miss the magnificence of the area’s forests and stately pines that shelter the Azaleas beneath their canopy. One cannot do justice to Nacogdoches in just a few pages. It’s a city that needs to be explored to be appreciated. There are regular festivals and celebrations that not only afford an excellent opportunity to learn about the city but to meet and mingle with the people, friendly country folk who enjoy a good conversation next to a puffing stand of East Texas Bar-b-que. Among the most popular events are the Americana Fest in April celebrating American music, the Texas Blueberry Festival held in June, the Nine Flags festival held towards the end of November and the lighted Christmas Parade, always a hit with the kids. There are many more cultural events, from rodeos to exceptional theater, as well as athletic and other events throughout the year in the Old Town. 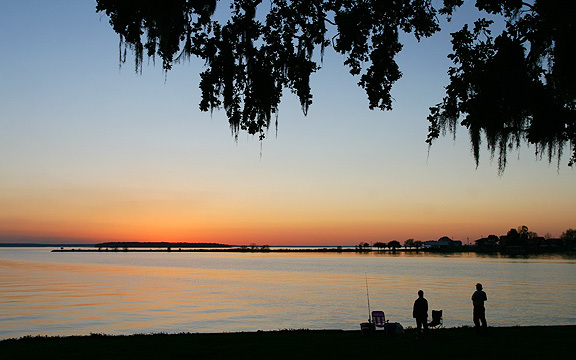 Nacogdoches offer first-rate lodging, fine dining, and plenty of things to see and do. Visitors to Nacogdoches will quickly appreciate the laid-back nature of a town steeped in history and comfortable in its own skin. Nacogdoches is all country. The cities of Lufkin and Nacogdoches, tucked away in the Pine Forests of East Texas, are two cities that are not exactly “twins” but more like fussy siblings who get along fine but are always poking at each other in friendly rivalry. The squabble over who is the “capitol” is only the latest fuss. 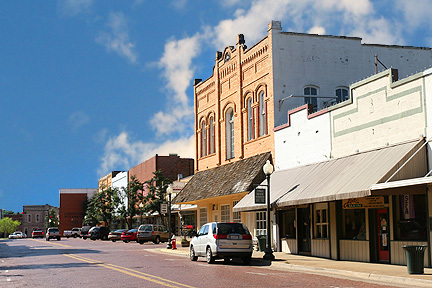 Nacogdoches is the oldest town in Texas and one of the oldest in North America. Lufkin is just a kid by comparison. Whichever is “capitol” of Forest Country, either is an excellent starting place for the great Forest adventure. 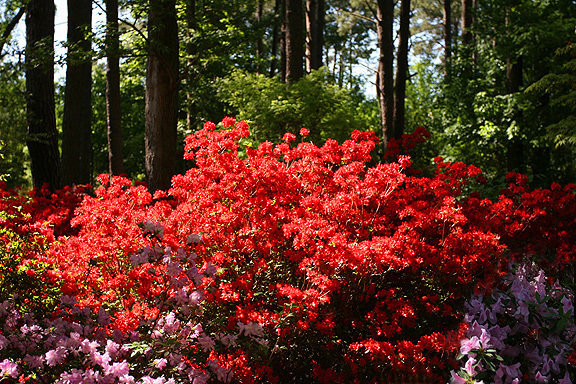 Click on the play button to the right to take a Take a tour of the Ruby M. Mize Azalea Garden in Nacogdoches Texas. The Ruby M. Mize Azelea garden is an eight acre public garden, built as a project of Stephen F. Austin and Stephen F. Austin Mast Arboretum in 2001. For more information visit the official site for the garden at Nacogdoches Azalea Trail.